On March 1, 2018, the afternoon students of the Pasadena campus took advantage of the beautiful weather (and the free admission!) 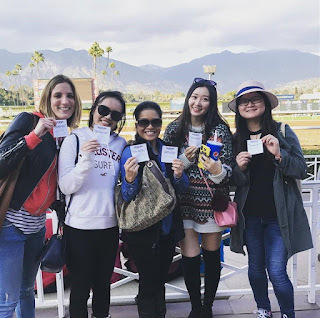 and visited Santa Anita Race Track in Arcadia, California. The students enjoyed the gorgeous scenery before them - the foothills of the San Gabriel Mountains, the historic architecture of the park, and of course, the majestic horses and their jockeys vying to win the races. Many of the students tried their hand at betting, which proved to be an excellent lesson in English! There is a special “language” to placing a bet, in which a person must specify the race track, race number, the horse (or horses) he or she wants to wager on, and the type of bet he or she wants to place. With numerous ways of betting (exacta, trifecta, pick 6, boxed numbers, etc. ), this can be an overwhelming experience for any person, native speaker or not! Nonetheless, the students gave it a crack, placed their bets, and some of they even won! Overall, it was an enjoyable day at the races and a wonderful lesson in local history.